If you don't shoot traditionally or instinctively you need a bow sight. Compound hunters swear by them and recurve bowmen also benefit. Picking out the best bow sights isn't easy are there are hundreds to choose from and they come in many different variants. Do you need a single pin or multiple pins and which is best? 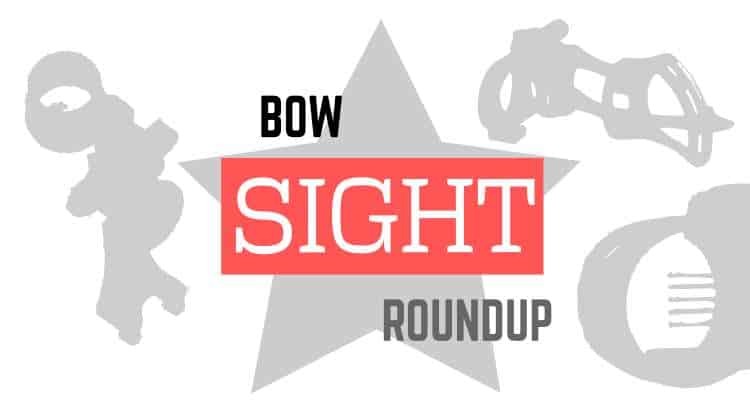 In this guide we're going to explain all those variants and introduce you to some of the top picks in each of the various bow sight categories. If you're looking for peep sights we've also got you covered, but that's here in this article. Fixed pin bow sights usually come with either 3, 5 or 7 pins visible through the sight aperture. The idea is that you set each of the pins to correspond to a known distance by sighting them during practice before you shoot. When you are in the field hunting or maybe 3D or field shooting, you are able to judge your actual distance to target. You can then use the relevant pin to line up with your target. You should be aware that is comes down to you to remember which pin corresponds to which range as you will have set the pins and determined effective ranges beforehand. The highest pin will correspond to the shortest known range to target and the lowest will give the bow the highest elevation and correspond to the longest distance to target. Pins on this type of sight can sometimes be adjusted to give you a sight window fitting your preferences.. They can be colored and even lit to make the aperture easy to find in low light conditions. Where do I set bow sight pins? Pick the shortest range you think you will ever need to shoot at, say 10 yards and sight in the top pin at this distance. The remaining pins would then be best set at around your maximum and preferred shooting ranges, i.e. 20, 25, 30, and 40 yards for the bottom pin. This would give even spacing to the pins and more pin choices when shooting around your preferred 20 - 30 yard distance. Single pin bow sights are exactly that. The sight aperture will contain only 1 pin. The idea with a single pin sight is that the entire sight housing or pin is easily adjustable. You can move it up or down whilst in the field without tools or adjustment aids. A single pin bow sight will normally have an easily accessible adjustment knob or lever with markings to allow you to change the effective targeting range of the pin before you take your shot. Whether you prefer a single-pin to a multi-pin can be down to personal preference. Some food for thought on the advantages and disadvantages of the single pin and multi-pin bow sights are discussed in this video from ScoutLookWeather. To summarize, a single pin sight only gives you one thing to think about when you look through the sight. The trade-off is that it needs adjustment if the target range changes. A multi-pin allows you to dynamically sight different ranges without adjustment, however there is a decision to be made beforehand on which pin you should be looking at. A lack of familiarity with that pin choice can cause you to hesitate and lose your shot. This type of sight is specifically designed for when you need to sight your bow on uneven terrain or possibly from a tree-stand.​ Normally with the correct amount of bending at the waist you won't need a pendulum sight. However the principle is that as the bow tilts when performing a downward shot, the sight will remain perpendicular to the ground and still give you a good sight picture allowing for compensation in these awkward situations. You'll find sights on both compound and recurve bows but generally there are differences between those built for one bow or the other. A compound sight may have a lens to magnify the target, in order for that lens to allow enough light through a large aperture is needed. A recurve shooter will rely on their own eyesight and no magnification of the target. Therefore they can get by with a smaller aperture, and a smaller aperture will provide them with a clearer sight picture. There are also different competitive rules governing both recurve and compound archery competitions these rules also have determining effects on the development of sights made for either style of bow. Many recurve competitions exclude the use of lenses and levels. Can you use a compound sight on a recurve bow? Yes. If you ensure that the fitment of the sight allows it to mount on your bow you should be able to use it, however you won't be allowed to do so in competition. There are all sorts of sight accessories available from cross-ring inserts to covers and sun shades. You can replace the sight level on your sight (or even add one if your sight didn't include one). There are aftermarket sight lights for people shooting in dusky conditions that will illuminate hard to see pins. They are rare and we don't cover any in this article but some bow sights can accept magnifying lenses. 2x, 4x and 8x magnifications are common. You may find magnification helps with your accuracy. This can depend on your general eyesight. Adding over 4x magnification to a bow sight will mean that instead of seeing tiny pins you'll be lining up baseballs. The best hunting sight for you is really going to come down to personal preference and price. Take a look at the section above on the differences between multi-pin and single-pin bow sights. If you hunt from a tree-stand a pendulum may be the better choice. Hunting at dusk you're going to want illuminated pins. Our reviews below should help you identify some of the best of each available on the market today. Demand drives prices. Bowhunting and archery are pretty affordable hobbies and there are some good sights on the market that really don't cost the earth. We've found them and listed them in this article. There are products on the market that integrate a laser rangefinder with a bow sight. The problem here is that in some states this is illegal for bow-hunting and certainly won't be allowed in many competitions. It's also another distraction to add to the sight picture which you just don't need. We'd recommend you stay away from these devices and learn to judge distance effectively. This is one of the joys of the sport! It's pretty amazing that considering the price of many bow components nowadays that you can get such an integral piece of kit machined out of 6061-T6 aluminium at such a low price point. This bow sight from Great Deals won't come with a brand name you know and trust, but it does have 3 pins with fiber optic tips, 2 green and one red and a bubble level. You can mount this on both left and right handed bows so long as they have a universal mounting system. The entire sight aperture is removable leaving you with just pins if that is how you like things setup. Don't expect this sight to give you the quality of sight picture in low light that a more expensive sight would, but for an introduction into the wide ranging world of bow sights this is a very affordable choice. Trophy Ridge have managed to hit the nail right on the head again here when it comes to the combination of quality and affordability. The Volt 5 (as the name suggests) has 5 pins with fiber optic tips for good visibility at dusk or in low light. These pins are bright and slender, easy to see and don't mask a lot of the sight picture like some models can. The sight has a bubble level that you could switch from top to bottom with a bit of fiddling if you're mounting it on a left handed bow. It is pretty well attached though so we wouldn't recommend this if you're worried about breaking anything. Another nice addition is the the green accent on the sight aperture. This makes that aperture quick and easy to locate when you're getting ready to shoot. This sight housing is coated with a rubbery substance and feels well made. This also comes with a nice bright sight light that you can use to enhance visibility further in low light conditions. Moving up the price scale slightly we get to the TruGlo carbon hybrid. This sight is made from a combination of carbon composites and aluminium which is designed to give increased durability without sacrificing for weight gain. This is light and durable and the carbon construction help with reducing vibration. You can adjust the ​elevation and windage on this sight without tools. You only need tools to adjust the actual pins. If you purchase the variant of this with a sight light included you'll get three levels of brightness adjustment in that light, but the pins are bright enough without that extra light. This also features glow in the dark paint on the front edge of the aperture to allow you to locate it at dusk. Great for hunting. Another point to note is that if you prefer your bubble mounted on the top or are a left handed archer this one allows you to switch that bubble mount to the other side of the aperture without breaking any glue seals. The IQ micro bowsight features something the manufacturers call retina lock technology. That technology is claimed to make this the most accurate sight that is on the market today. It is another handy addition to your sight window that allow you to see how in-line your eyes are with the sight itself. This can help you spot and correct for small torque or anchoring issues in your setup. There is a small dot visible at the top of the aperture that sits in the middle of a green circle when correctly aligned. If you're off, then that dot won't be central. This has ultra bright pins as the steel reinforced fiber optics are longer than your standard sight, you can also add an optional booster to that but this doesn't come out of the box and is sold separately. There are knurled micro adjust knobs on this to allow you to adjust both windage and elevation and lock them in place without tools. These self locking knobs can be removed and replaced with fixed screws. You can adjust the pins to be closer together than on some other sights as the pin design is staggered meaning the bases of the pins can sit closer together. Tropy Ridge are back again with another well priced piece of kit packed with features you'd sometimes find only on much higher priced models. This one is a single pin, that pin is ultra bright fiber optic allowing you to see it any conditions. This sight has been designed to be quiet. The adjustment action has no metal to metal contact making that a reality and you're covered in dusk or low light not only by the fiber optic pin, but by the glow in the dark indicator tape and a glo-ring on the aperture. You'd be hard pressed to beat this sight spending twice the amount. This is a top quality single pin sight. You're going to pay more for this than other sights in this review but if you want something made to a very high standard that's a joy to use then this is where you need to look. This is one of the #1 selling single pin sights on the market. ​One of the unique features of this sight is the no look 'Blind 20' distance setting. This is a feature that allows you to set a predetermined distance setting and quickly return to it without having to look. That's going to be useful in changing conditions where you need to react quickly. The operation of the wheels is silky smooth and ​features 'zero slop', meaning there is no play or inaccuracy in the adjustment and the distance you set is the distance you'll get. The pins on this sight are also encased in aluminium, that makes them impervious to small knocks and bumps that they are likely to encounter under heavy use. If you're going to be shooting from an elevated position say a tree-stand you may be interested in a pendulum sight. 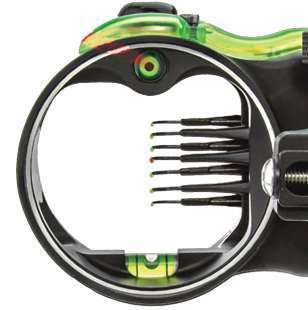 This sight from TruGlo will swivel and stay perpendicular to the ground irrespective of the angle of your bow. This helps you to compensate when shooting for upto distances of 35 yards. The pendulum on this can be fixed in place when you need to shoot from the level so it's versatile and usable when you aren't in a stand. The fiber is bright and protected by an aluminium stand which only adds to the durable nature of this sight. Again, just like with other TruGlo offerings this one has a glow in the dark aperture ring which makes for easy sight acquisition in low light conditions. I hope this roundup was useful and led you in the direction of a quality component for your bow. Please let us know if we're missing your favorite and need to add it to this review, or if there​ are any aspects of any of the above we've not covered correctly! Either leave a comment or send us some feedback!